One of the main characters in our new show SAUDADE. See our homepage for more details. 1. Simple materials and tools. Often when I say that I make shadow puppets, I get the response “Oh, you mean with your hands?” The oldest form of shadow play was probably created with human hands, but today you can use cardboard, thin plastic folders, and tape to cut out and put together whatever kind of puppets you imagine. No need to invest in expensive equipment or materials–shadow puppets can be made with the contents of your desk drawer. 2. If you can use scissors, you’re good to go. It takes a lot of practice to successfully create a puppet using some methods, such as woodcarving. Other methods are easier, but can quickly get messy (like paper mache). Shadow puppets, however, only require the use of a normal pair of scissors, or maybe an x-acto knife. You might still want to supervise very young children trying their hand at it, but this is a puppet form that all ages can attempt with confidence. 3. Transformation is magical. 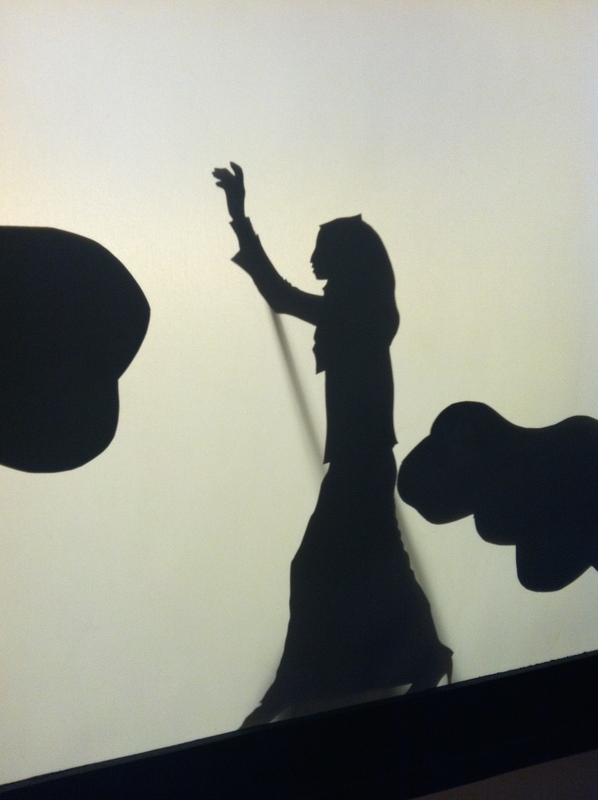 One advantage of shadow puppetry is that you can achieve lots of different effects with just one puppet. At a workshop I took in Argentina, we played with using two light sources, varying the distance between screen and puppet and the angle of the puppet. You needn’t feel restricted to flat cutouts in shadow puppetry either–try playing with images of your hand, objects and furniture as well. With all the pieces hidden behind the screen, the audience will be amazed as your puppet grows, shrinks and turns into someone new in a matter of seconds. 4. Join a very, very old tradition. There’s no real way to be sure, but I’d say it’s likely that the earliest form of puppetry was when people sitting by fires thousands of years ago in caves started to manipulate the shadows thrown by the flames. This is an art form that has changed and mutated many, many times over the years and is still in the process of growing. Why not join in? 5. A lesson in simplicity. Getting to the essence of a story, character, or action is often the hardest part of creating a puppet show. Because shadow puppets are usually a silhouette, they require even more care in the choosing of an image. Shadow puppetry is a wonderful way to find the core of the story you are trying to tell and how best to communicate it to your audience.